This New York Yankees MLB 2017 Authentic Collection 59FIFTY Cap features an embroidered (raised) Yankees team logo on the front and embroidered MLB� logo on the rear. Interior includes branded taping and a moisture absorbing sweatband. 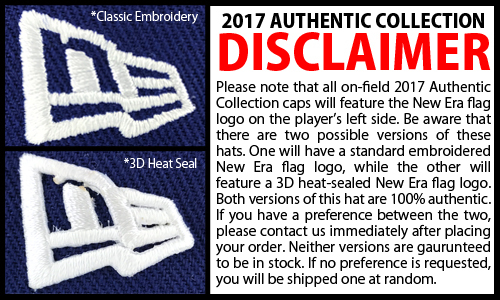 All Authentic Collection caps for the 2017 season will feature an embroidered New Era flag logo on the side as well.